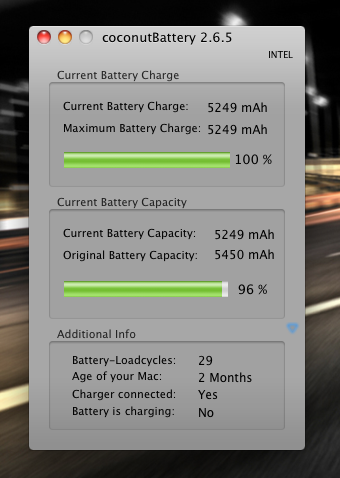 At this rate my MacbookPro 13″ (mid 2009) battery will not last the claimed lifetime of 5 years. About 2 months ago (end of august ’09) — as coconut battery correctly displays — I started out with a battery capacity of around 5450 mAh. This has been dropping steadily (99%, 98%, 96%) over the course of those two months, as far as my infrequent readouts can be trusted. I have not seen many reports about bad quality. Though one discussion post also reports a quick drop to 96%. At 29 cycles, I have run this battery down below 50%, and charged it back to 100% about once every two days, give or take. Going below 5% at least 5 times. My only hope is it took this long for the battery to get calibrated to its actual charge of 96%. Only time will tell. 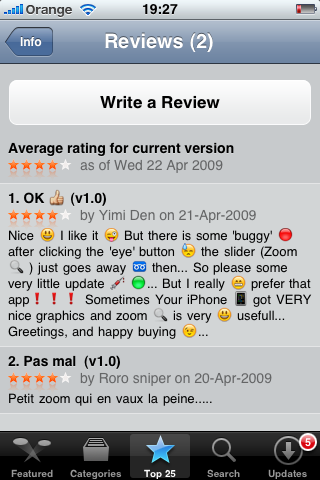 In his latest review, Walt Mossberg, discusses Windows 7. He calls it a more tolerable, less annoying version of Windows when compared to its predecessor. He goes on to mention some of the evolutionary features, like Snap and Aero Peek, and of course the — Redmond start your photocopiers — new Taskbar. Although I agree that the taskbar feature is undoubtedly a great addition to 7. First of all, app preview in 7 is triggered by hovering your mouse pointer over a taskbar icon for a short amount of time, it does not matter whether it was on purpose or not. SL does this when holding the left mouse button for a short amount of time. This is also where aero peek comes in. By hovering the preview thumbnails, you can get an actual real-size preview of the window, with all other windows turned to glass in the background. In SL you can use the spacebar to get the same window preview, just like you are used to when calling QuickLook on files. Secondly, the touch-screen capabilities — which only work on very specific touch-screen hardware, Walt tells us — and require you to stretch an arm and grease up your screen. All Mac laptops come with a large glass multitouch trackpad that allows very similar interaction. MacOS has a completely different philosophy when it comes to application windows. For one, it does not know the concept of maximization. A window is either in user-defined size or standard size, meaning as large as it needs to be to optimally show its contents. Granted, depending on the application, standard size sometimes borders on maximization of the window. This difference is generally really hard for switchers to grasp. Anyway, why would you want to resize a window to a factor of the screen size? Reminds me of the Windows 3.11 cascade and tile windows features. Who cares about what is inside of a window anyway? 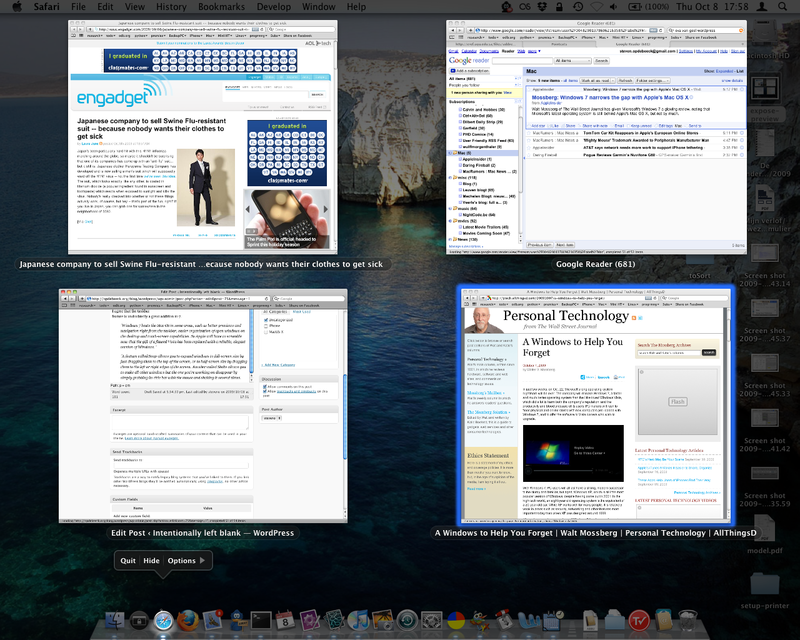 As long as my windows are nicely aligned on the desktop. Not. Just when I thought we had seen it all with the Live Messenger buzzer message that shakes the messaging window. Windows 7 now invites you to start shaking windows yourself. This might be like something you would do with a handheld device — like the iPhone, where shaking triggers Undo — but I cannot see myself shaking my windows on the desktop. 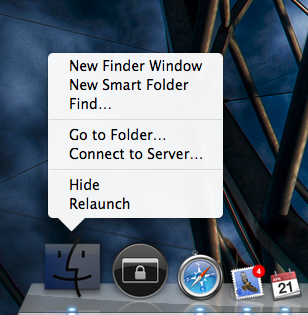 MacOS has supported hiding of all but the clicked application windows by option-command clicking the dock icon. No argument here. I too hope Windows 7 will be able to replace the aging dinosaur some call XP.